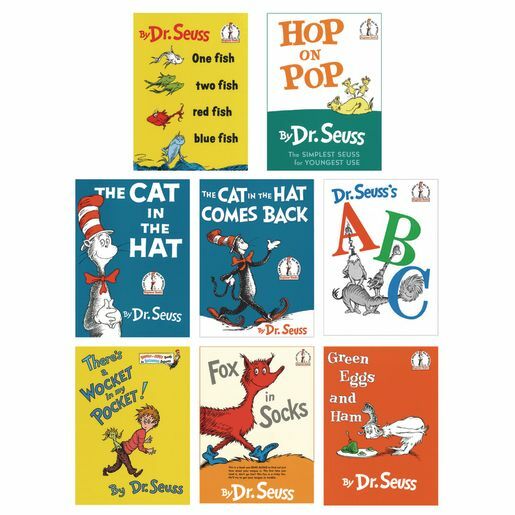 A favorite of children for years, Dr. Seuss books are perfect for the classroom! When you combine silly rhymes and repetition with zany characters, you have a formula for encouraging children to listen, thus encouraging their interest in reading. Set includes: One Fish, Two Fish; Green Eggs and Ham; Hop on Pop; The Cat in the Hat; Fox in Socks; Dr. Seuss's ABC; The Cat in the Hat Comes Back; and There's a Wocket in My Pocket! Each hardcover book measures 6 1/2" x 9".